Most people who take an African Safari travel with a tour company. They tend to be accompanied by professional guides that let them know the rules and how to behave safely and appropriately. 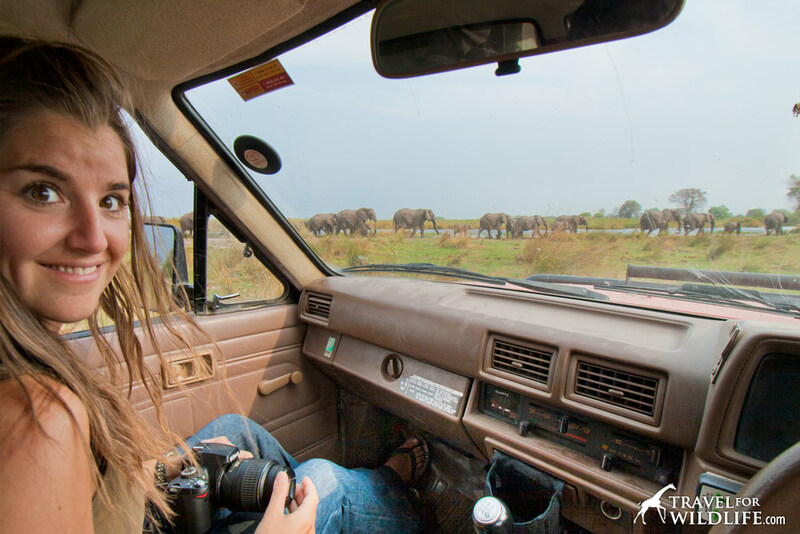 But if you are an independent traveler like us and opt to rent a vehicle and do a self-drive safari, chances are that nobody will tell you what not to do on an African safari. So how is one to learn proper safari etiquette? 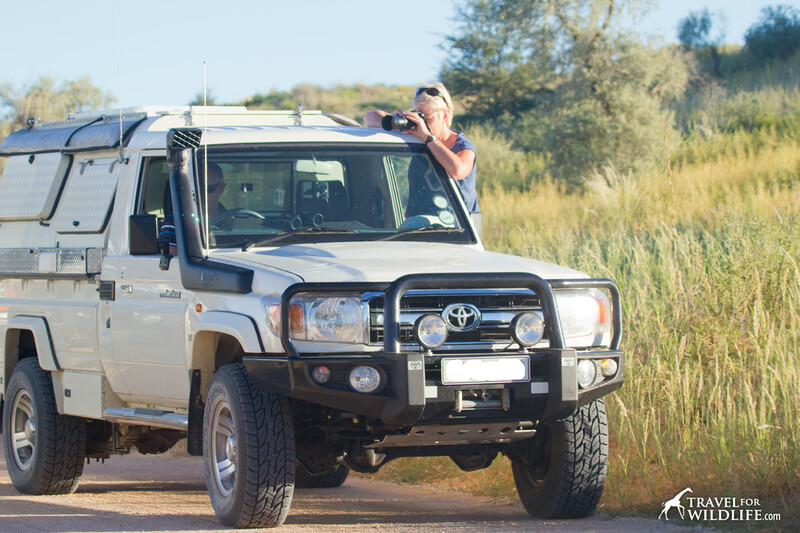 Our number one concern when we go on a self-drive safari is to be aware of our surroundings and to not do anything that may harm or bother wildlife in any way. Truth to be told, it is very easy to get carried away and to forget how important this is. Watching wildlife in Africa is such an exciting and intense experience, it is very likely that some rules will be broken by accident. Some of these rules may seem like common sense while others might actually seem counter-intuitive. For example, some first time wildlife travelers actually think feeding a wild animal is doing a good deed, when in reality it is extremely harmful. On the occasions we’ve found ourselves breaking the rules, we wound up feeling really bad about it. We’d like to help you learn from our mistakes. After all, it wouldn’t make any sense to cause harm to the very animals you’ve traveled half way around the world to see, would it? 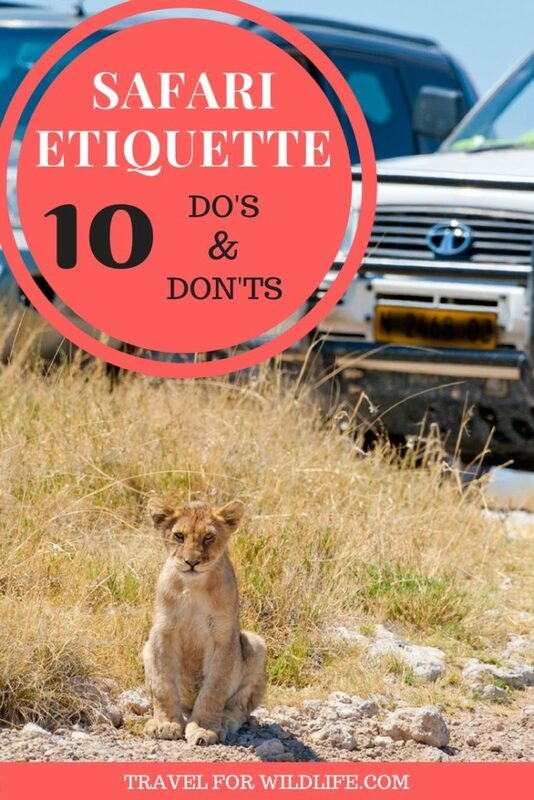 Learn how to avoid this list of no-no’s and you will become a champion of safari etiquette! 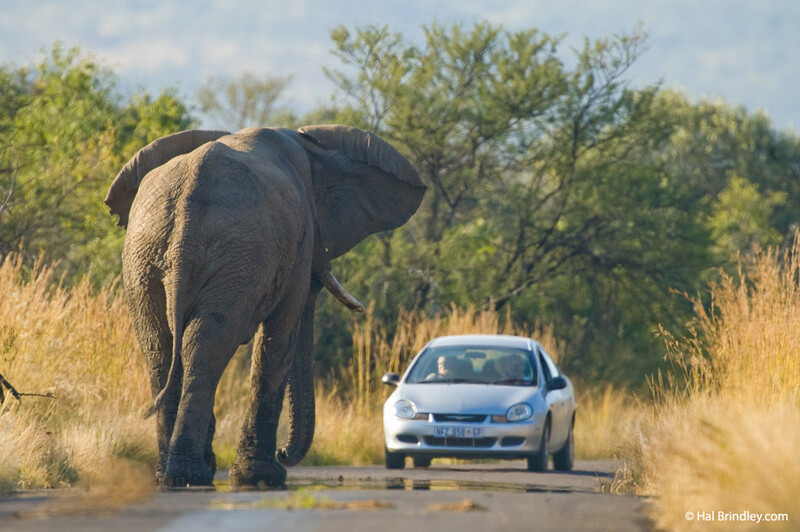 When driving around in your safari vehicle, don’t get too close to wildlife. It doesn’t matter how cool the sighting is. Everybody needs their personal space, even animals. I get upset when people invade my personal space, but I won’t stomp on your car if I get upset. Some elephants might. A bit too close. Spread ears are a sign of agitation. If you find yourself in this situation, put the car in reverse and back up slowly. Wildlife is just that: wild. They are not pets, and like all individuals they behave unpredictably and are potentially dangerous. You don’t know what they might be thinking, and you can’t know how they’ll react. Give them enough room so they can behave naturally, and not feel threatened. This one is kind of like “give wildlife room to work” but taken to the extreme. It requires its own point. To illustrate just how tragic the consequences can be, I’ll recount a story that was featured in the book 101 Kruger Tales: Extraordinary stories from ordinary visitors to the Kruger National Park . 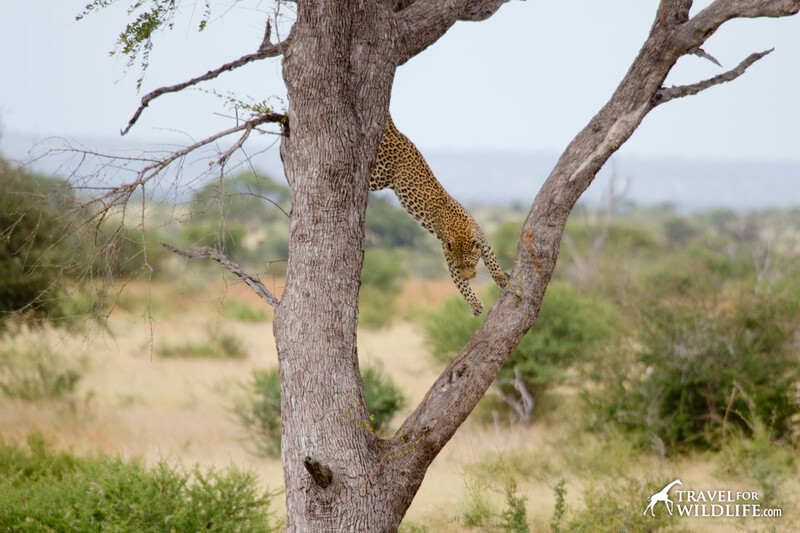 It is the story of a leopard that was spotted near a campground perimeter fence by a bunch of enthusiastic tourists in Kruger, South Africa. The visitors were so eager to see this beautiful animal up close that they managed to corner it against the electric fence with their wall of cars. The leopard, desperate to escape, had no choice but to run into the fence where it was electrocuted and died right in front of their eyes. If you think that a situation might become dangerous for an animal (or even just stressful or annoying), the best thing you can do is to leave the sighting. These are traffic jams that originate with the sighting of a lion, leopard, elephant, rhino, or some other animal near the top of every wildlife watcher’s list. 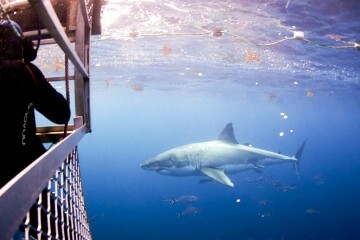 If you stop at this kind of sighting, be mindful of other visitors trying to watch. So many people pull over wherever they see fit, without taking into account that they might be blocking other people. Be nice to others. We understand, it’s the first time you’ve ever seen a lion and you’re really excited to catch a glimpse. But here are two suggestions for doing it right. One, work your way into the mess, snap a few photos, watch for a couple minutes and then move on. 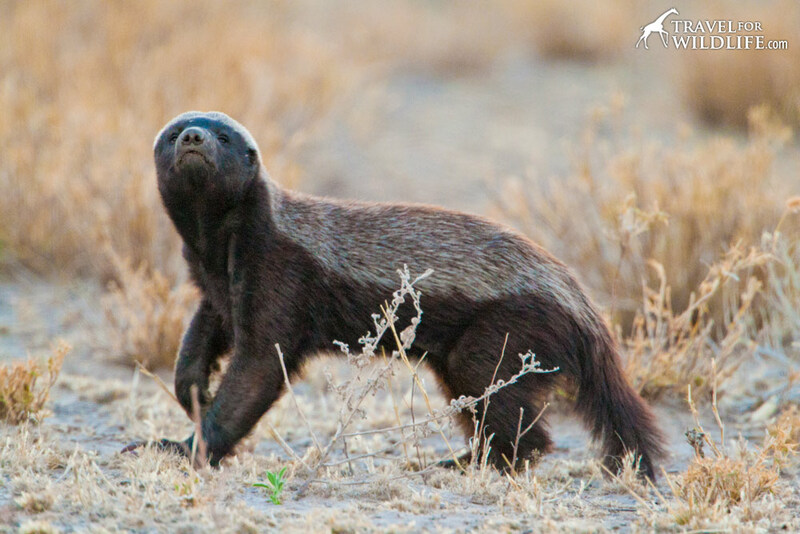 Don’t worry, you are sure to have more great sightings! And always remember to turn your engine off when you stop. There’s nothing more annoying than hearing the loud whir of an engine right next to you while you’re trying to enjoy a peaceful moment with a napping cheetah. A second option is to park yourself at comfortable distance away from the jam and make yourself a sandwich. People have remarkably short attention spans and as soon as the animal lays down for a nap or ducks behind a bush, they get bored quickly. If you are patient, you may end up having an amazing sighting all to yourself. We waited patiently from a distance while this leopard slept. Everyone left the “leopard jam” and then we were the only ones to see him climb down! Sometimes when you are alone at a sighting other cars will stop and ask you what you are looking at. You’ll be surprised how easy it is to make “safari friends”, people that you see regularly on your drives who will share great information with you too. In all the large national parks in southern Africa (Botswana, Namibia, South Africa) there is one cardinal rule: don’t get out of your car during a self drive safari. This is not just a simple matter of proper safari etiquette. If you get caught by a ranger outside a car you will probably be expelled from the park. If you get caught by a leopard or lion outside your car, you might never be heard from again! 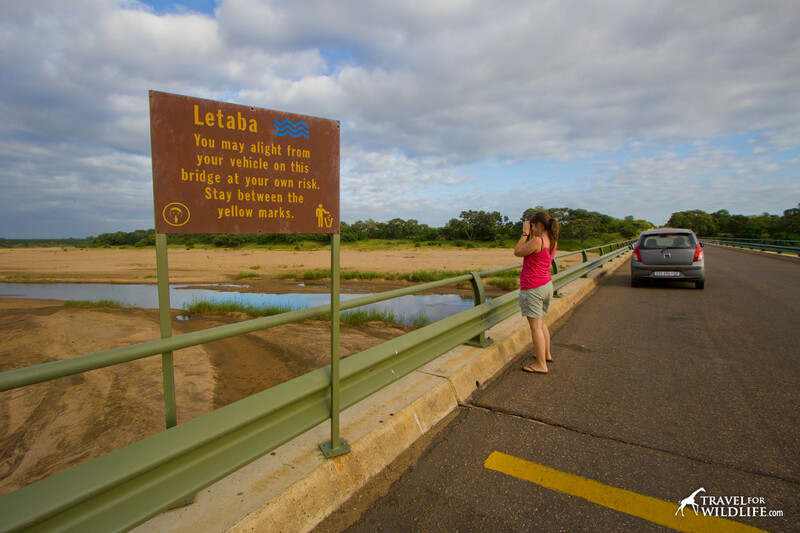 There are some places within national parks where you are allowed to leave your vehicle, like in picnic areas or in the middle of long bridges. These places will be clearly signed. If you don’t see one of these signs, do not leave your vehicle! Pretty simple, right? Unless you see a sign like this one, don’t get out of your car! I’ve seen more offenders of this rule than I care to remember. People know they’re not supposed to get out of their car, so instead they lean out the window to get a better view or, worse yet, sit on the car window to peer over the top of their hood. This is against park rules and for good reason. Wildlife in these parks are habituated to cars. 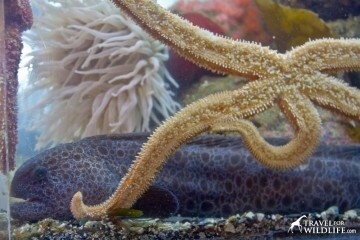 They know what they look like, how they sound, and how they smell. To most animals in national parks, cars are just a harmless part of the landscape. A moving rock. But when the shape suddenly changes, and the form of a human emerges, it freaks them out. They know something is wrong, and they waste energy and resources trying to figure out what’s going on, or even worse, fleeing. Wouldn’t you rather they reserve that energy for when they have to flee from something that might actually eat them? And there’s one other major problem with sitting on the car window. Who is watching your back? 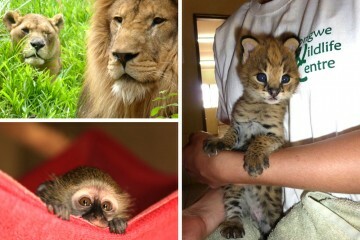 Not your safari partners. They are busy watching the same sighting you are. How many times have we been watching a sighting when a large animals pops out of the bush directly behind us? Enough that we now know who is actually watching your back. That lion sleeping in the little tuft of grass you didn’t check. This one seems like a no-brainer to me but…really. People feed wildlife ALL THE TIME. We’ve been told about tourists throwing steaks to lions in Kruger. I’ve seen people throwing meat over the campground fence to hyenas in Kruger too. “He’s still chewing it right now,” I indicated with a finger as the jackal looked on, munching away. Even though the NO FEEDING WILDLIFE signs are up in every National Park, people still do it all the time and it has to stop. This also applies to passively feeding animals by not storing food properly. Once you’ve had your camp raided by baboons, you will understand the importance of this. It is just as much a crime as feeding animals directly. One large male baboon, known as Fred to the locals in South Africa’s Cape Point, was famous for stealing food from tourists. He was recently euthanized for being “too aggressive.” Please lock up your food out of sight! If you see someone feeding animals, you should report them. If you care about wildlife, let them eat their own food. Let wildlife eat their own food. 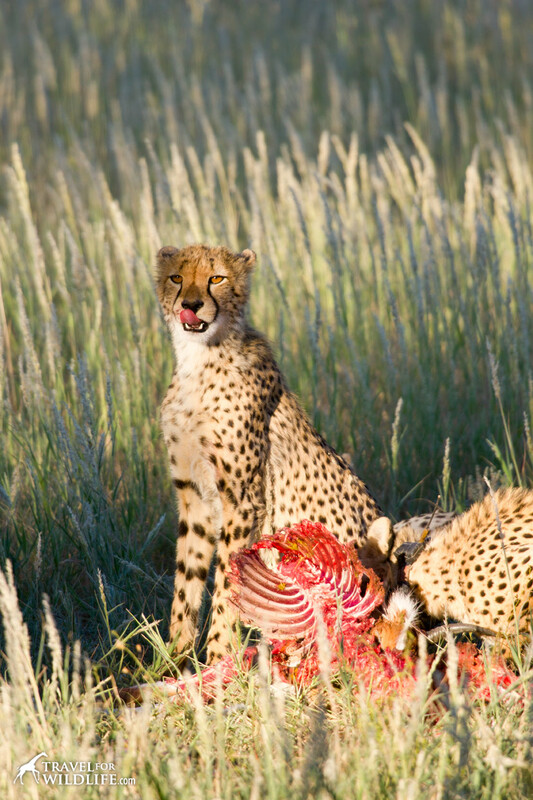 A cheetah family on a springbok kill. It is just crazy how many animals are run over on African national park roads due to people speeding. Just the other day I read of a car accident in Kruger where a hippo got killed. There has also been at least one accident involving a rhino. How is it possible to miss a hippo or a rhino when you’re driving at the speed limit of 30 miles per hour (50kmh)? It’s not. These people were speeding. One of the most common problems involves tourists rushing to get back to camp before gate closing time. 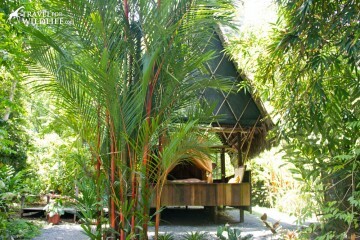 Each night, all visitors must enter the enclosed rest camps before a certain hour. Generally this time is set just before sunset so that nobody is out driving around after dark. The problem is that sunset is also the best time of day to photograph animals in beautiful golden light. So you always want to stay just a little bit longer and a little bit longer. And then all of a sudden you’re driving too fast and trying to avoid that fine for being late. There’s an easy solution. Look for creatures close to camp in the evening! Now you don’t have to run anybody over! 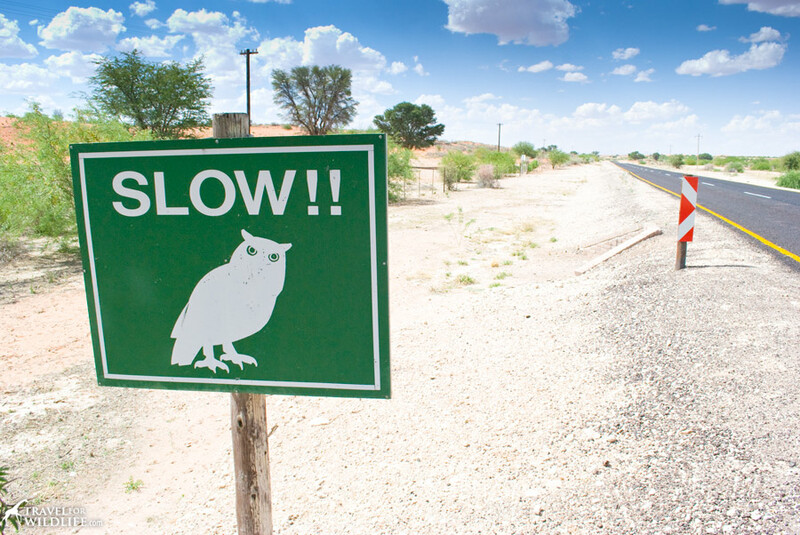 Many animals sit in the road at sunset like the spotted eagle owl. Slow down and save their lives! We’ve also seen this one surprisingly often and it drives me crazy. Visitors shouting or making loud noises so an animal will look at them and they can take a photo. Are people really that selfish? Unfortunately, yes! Animals are in survival mode 100% of the time. They have to feed themselves, raise their young, and be vigilant for predators. It may not seem like much, but those couple of seconds that you make them stop eating or napping, when multiplied by the number of visitors who come through each day, might add up to the amount of energy they needed to catch their meal or avoid becoming one. Is your photo worth that? By simply letting animals go about their business, you’ll get photos of natural behaviors and animals living healthier happier lives. And also…other visitors don’t want to hear people shouting! HELLOOOOOO! No-brainer! You wouldn’t litter in your own home so don’t do it here. You may think that food waste is OK because it’s going to decompose, but bits of food are what draw small animals to the side of the road where they get run over by delivery vehicles at night. Simply keep a small grocery bag in your car and keep all your trash. No problem! 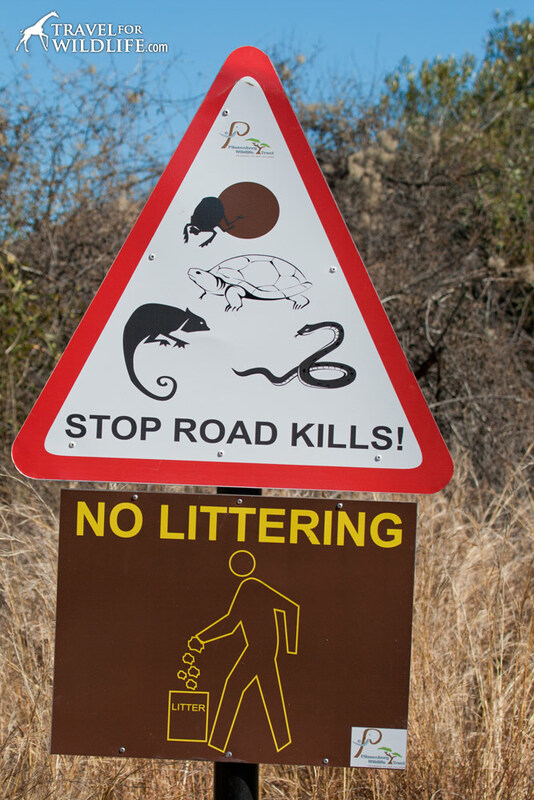 Stop Road Kills sign in Pilanesberg National Park, South Africa. You did it! 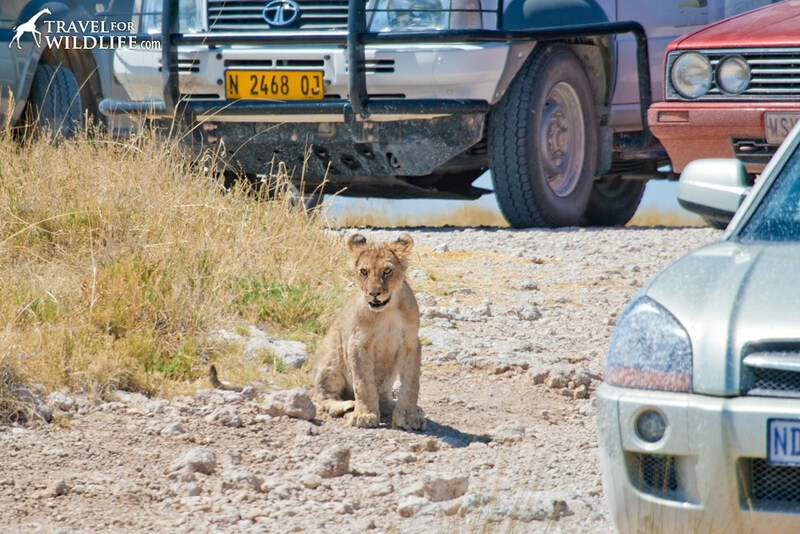 You’re officially a responsible wildlife traveler on an African safari. Congratulations. Proper safari etiquette will make your experience far more rewarding and the animals will thank you! Great summary of pointers that *should* be common sense but are unfortunately often overlooked. Respect for wildlife and the fact that we are in *their* environment is non-negotiable. Thank you so much Roxanne! Wildlife should always comes first. Good article but I don’t agree with you on the fact that if you go with a professional guide they won’t break any of the rules. 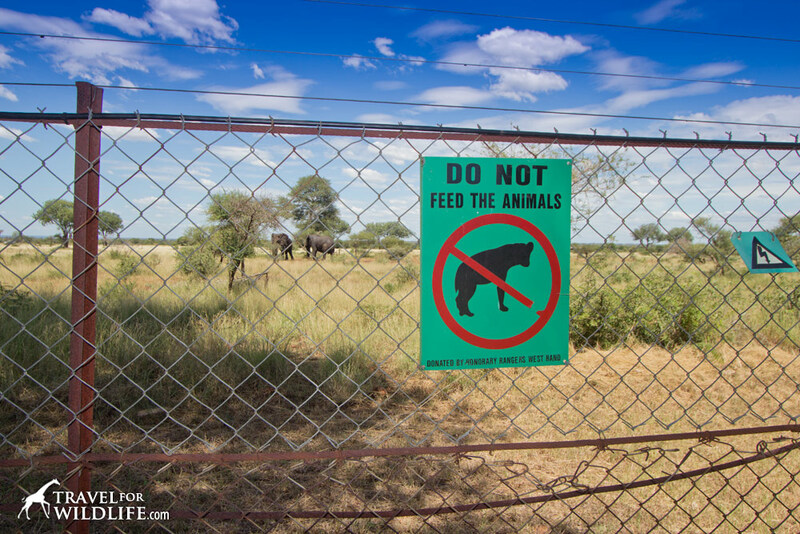 In our experience they are some of the worst offenders particularly in the Kruger and Etosha. They drive off road to get closer to the sighting, get too close to animals, block others view with their higher vehicles, leave their engines running the whole time. Often the guests scream shriek and jump up and down frightening away and animals but more importantly spoiling the viewing with the noise from the vehicle. Why don’t guides remind them or ask them to keep quiet. And why do the guides have to speak constantly drone on and on oh and don’t forget their radios. I am not saying all guides are like this but there are a lot that need reminding of the rules. 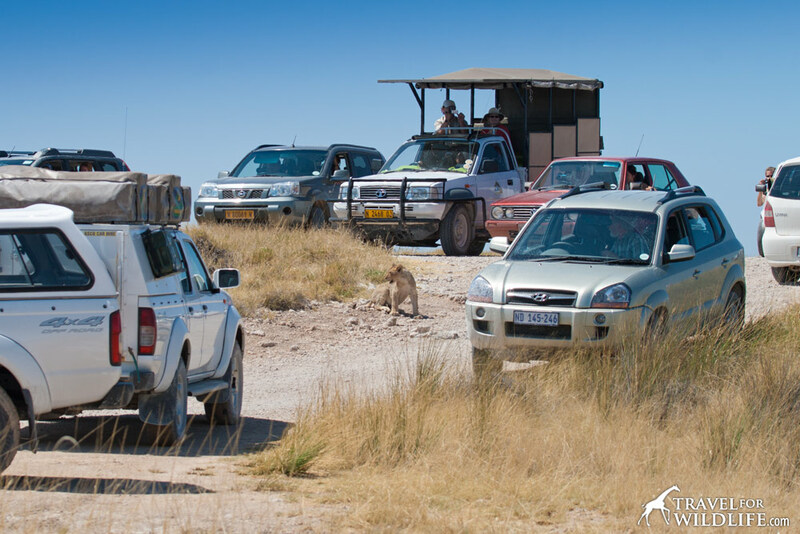 In the Kruger and Etosha we often drive away from great sightings because it’s been spoilt by “professional guides”. Unfortunately you’re absolutely right. Professional guides SHOULD be telling you how to behave appropriately, but sadly, guides occasionally think they are above the rules. We’ve rarely had problems with guides for the evening drives at the public rest camps in the national parks, but our experience at private reserves or lodges in the area tends to be a bit different (lots of driving off road and getting very close and some serious speeding). Oh and those big buses? Seriously, turn off your engine once in a while! So you make a good point. 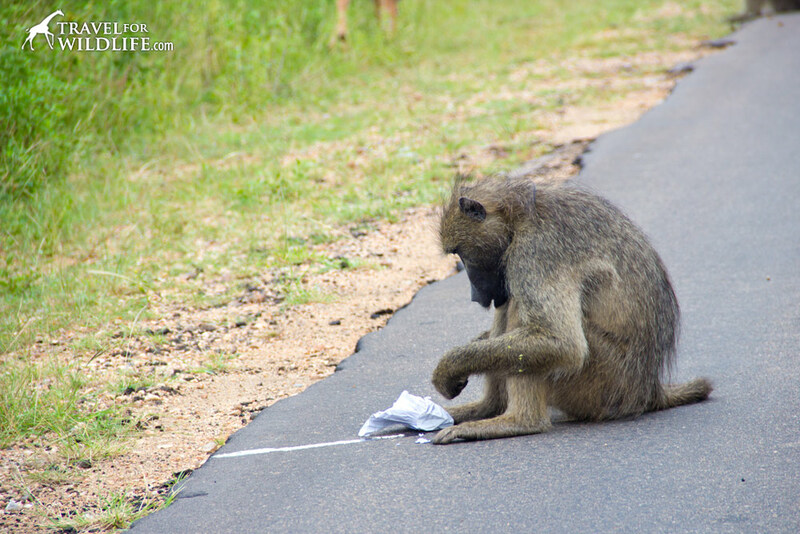 You can’t always assume that what the guides are doing is proper safari etiquette! Excellent post, I wish this could be handed out to everyone entering the parks and force them to read it. I have seen some crazy stuff on my self-drives and some people are truly clueless and some just don’t care at all. Glad the vast majority of visitors are well-behaved but the bad ones sure can ruin things for the rest. Yes, I totally agree. Rules should be handed to everyone entering, and not just mixed with all the reservation papers. No one reads them. We all want the same thing, to enjoy the parks and the wildlife. 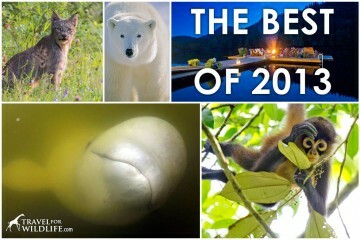 We should all work together so we (the visitors) have a great time and the wildlife can have a peaceful day. I know, right? I think that even the quiz could be challenging for some, since they cannot read signs that say “Do not feed wildlife” It would be a good experiment though! This is one of the best pieces of advice out there, and local tourism boards in African national parks should use this as a guide, unfortunately most guides are not well trained, or are ignorant of these best practices and can easily get ahead of themselves. There is a dangerous situation in one of the best parks in Western Uganda, Lake Mburo National Park where the drought is killing several animals, we are in the process of setting up temporary dams to alleviate the situation, feel free to check out the video on how bad the situation is, on our you caring page. I totally agree with Kelly, these rules and regulations should be handed out to everybody entering the parks. I really liked the article, it was informative. Thank you guys, i will surely drive with caution next time, its a very good point when you mentioned that animals like dont like their space to be invaded. I remember when i visited the Serengeti, the guys there mentioned about that too. You can check it out. 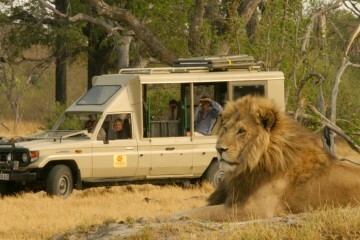 The trip advisers where so helpful too, you can check out Iconic Africa Trip advisers.